Urgent message: Children presenting to the urgent care center are often in a state of distress and agitation—to the extent that they may be difficult to treat when it comes to certain procedures. The parental papoose technique may help soothe the patient—and the parent—making effective treatment more accessible. It is common for a young child to enter our urgent care center calmly—while being held by a parent, only to start crying uncontrollably when separated from that parent in order to be restrained by conventional methods prior to having a nebulizer treatment, sutures applied or removed, or other procedures performed. With implementation of the novel parental papoose technique, a child may experience an added level of comfort, and be more cooperative due to the close proximity of their parent with whom they have a close bond. The mutual emotional and psychological closeness between a parent and their child forms the foundation for the success of this innovative technique, allowing the urgent care provider to administer care more efficiently while lowering the stress levels of both the patient and their parent. Head and neck wounds account for 60%-81% of pediatric lacerations.3-5 While some clinicians find the papoose technique to be beneficial during laceration repair in children, others believe it is better employed when giving nebulizer treatments; removing sutures (especially in the absence of anesthetics); nasal foreign body removal; and phlebotomy in younger toddlers. 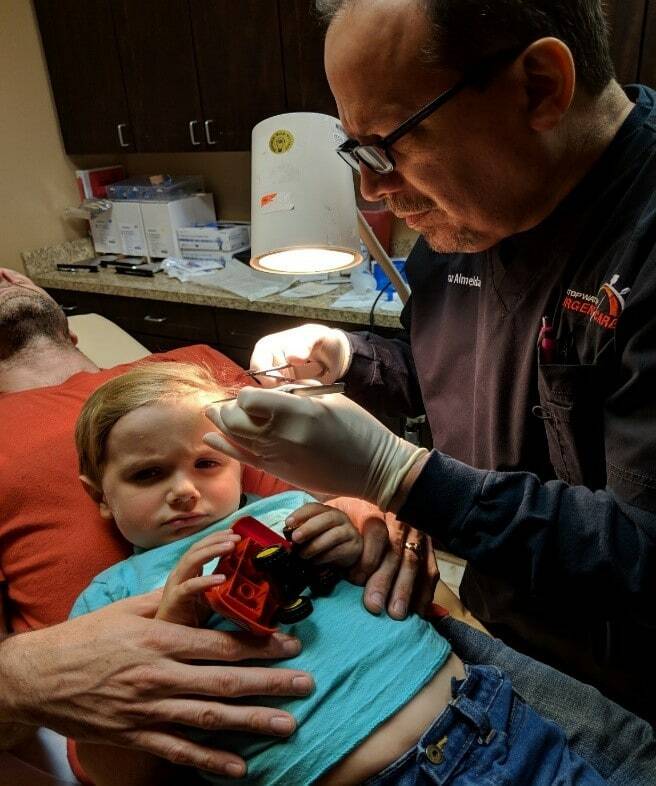 Unfortunately, many urgent care providers are uncomfortable providing some of these services in younger patients primarily because of the lack of restraining methods available for the injured, uncooperative child. A recent study in the Rhode Island Medical Journal reported that some urgent care providers send pediatric patients with facial lacerations from their facility to the emergency room for suturing.6 Unlike more mature patients, it is reasonable to expect a child with a facial laceration to have difficulty laying still while the urgent care provider sutures their laceration. Utilizing the parental papoose technique may help ameliorate this obstacle. With the parent’s active participation, the desired goal of decreasing sudden, uncontrolled movements of the child which could impede repair of their laceration can be achieved. Furthermore, a child will feel more secure if they observe that their parent is comfortable and trusts the urgent care provider. Further, some physicians find it is best to use the parental papoose technique only in certain situations, with patients of specific ages. For example, it is generally not effective in children 6 years of age and up, as they may be too big to sit comfortably and securely in their parents’ lap. 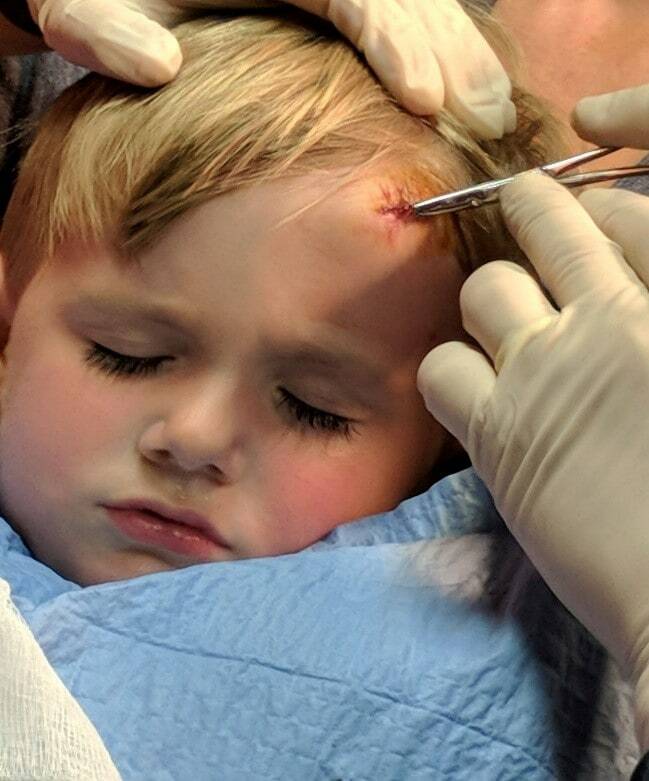 In the author’s experience, repair of forehead or chin lacerations can be enhanced with the technique; others find it cumbersome in such patients, but have noted its benefits in children with nasal lacerations—all dependent on the relative positioning of the clinician relative to the child. The first step involves counseling the child’s parent on the proposed procedure and emphasizing the importance of their role in keeping the child from making any sudden uncontrolled movements. Cooperation of the child is further enhanced by using a “vocal local”,7 an anesthesia technique giving verbal reassurance to the child by the parent and urgent care provider. Ideally, the participating parent should be counseled outside the presence of the child, and understand their role and task. Reassure the child that their parent will be with them the entire time. The parent then lays supine on the procedure power table (Figure 1) with the head of the table at approximately 30-45⁰ degrees (semi-Fowler position). With reassurance from the parent, the child is then placed on the parent’s lap. The parent’s arms are then wrapped around the child’s arms, and their hands placed over the child’s hands. The parent’s legs are then positioned over the child’s legs. This forms the parental papoose, immobilizing the child (Figure 2). The medical assistant then gently supports the child’s head at an appropriate angle for the procedure (Figure 3). If a patient is coming in with a prearranged appointment, recommend to the parent bringing a favorite stuffed animal or toy (Figure 4). This will preoccupy the child while you administer care. Contraindications include lacerations that are very jagged, many layers deep, located over a joint, or potential for nerve damage. Children who are combative and uncooperative before the procedure begins are not good candidates and should be referred to the emergency room. For a procedure to be successful, full parental cooperation is essential. 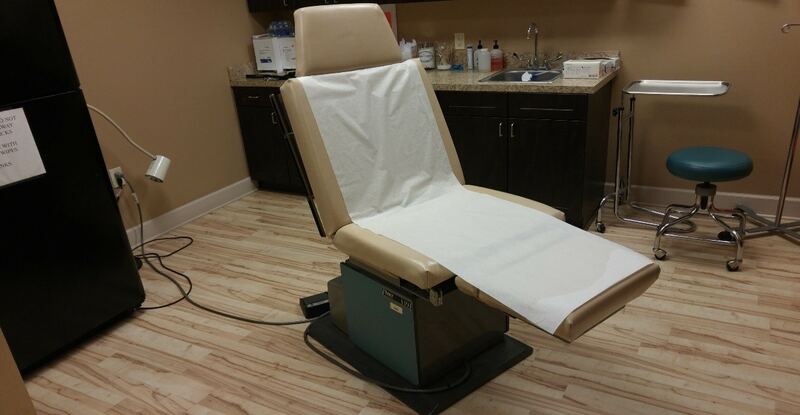 If the parent is hesitant or uncooperative during the preprocedure counseling, transfer should be considered. Finally, if the urgent care provider is inexperienced in repairing traumatic facial lacerations using the small caliber sutures utilized for repair of facial lacerations in children, then the child should be referred to the emergency room. 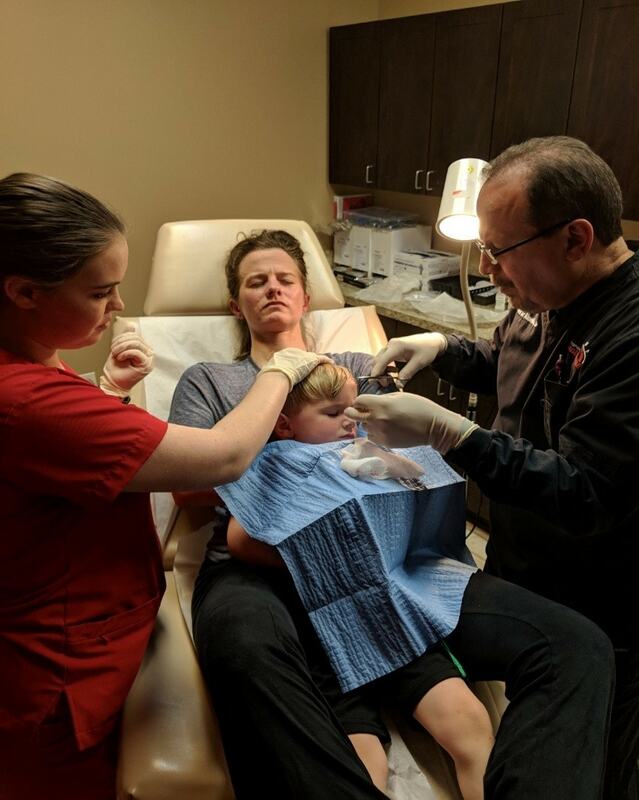 Urgent care centers are often the preferred venues of choice for parents to take their children for treatment of sudden complaints, some of which may require some form of restraint. Proper selection of the “right” situations for employing the parental papoose technique, based on the provider’s experience and comfort level, as well as the nature of the presentation, will allow for many procedures that might otherwise require transfer to be managed in the urgent care center. Hosey MT. UK National Clinical Guidelines in Paediatric Dentistry: managing anxious children: the use of conscious sedation in paediatric dentistry. Int J Paediatric Dentistry. 2002;12(5):359-372. Vogrin CL. Small smiles involved in child restrain law change. Colorado Springs Gazette. Published October 28, 2004. Nelson DS, Walsh K, Fleisher GR. Spectrum and frequency of pediatric illness presenting to a general community hospital emergency department. Pediatrics. 1992;90(1 Pt 1):5-10. Baker MD, Lanuti M. The management and outcome of lacerations in urban children. Ann Emerg Med. 1990;19(9):1001-1005. Smith GA, Strausbaugh SD, Harbeck-Weber C, et al. New non-cocaine-containing topical anesthetics compared with tetracaine-adrenaline-cocaine during repair of lacerations. Pediatrics. 1997;100(5):825-830. Canares TL, Brown L, Slotkin RM. Treating children at urgent care centers: A qualitative study to determine how providers perceive managing pediatric patients. Rhode Island Med J. 2015;98(1):48-52. Almeida OD Jr, Val-Gallas JM, Browning JL. A protocol for conscious sedation in microlaparoscopy. J Am Assoc Gynecol Laparosc. 1997;4(5):591-594. Oscar D. Almeida, Jr., MD, FACOG, FACS is a staff physician at Stopwatch Urgent Care LLC in Auburn, AL and a former adjunct professor of obstetrics and gynecology at the University of South Alabama College of Medicine.